The Stone Age residents of the Middle East, Southern Europe, and Central Asia were among the most innovative people in the history of humankind. Agriculture began in this region, and the first farmers domesticated numerous plants (including wheat), as well as animals: pigs, sheep, cows, and goats. Goat domestication began about ten thousand years in present day Anatolia, and domesticated goats soon emerged all over the Fertile Crescent region and beyond – from Israel to Uzbekistan. A recent study shows that domesticated goats did not spread from one point of origin, and that domestication was carried out in a number of locations in parallel. The study also reveals how new technologies spread in those times and the preferences of the early goatherds. The study was conducted by a large international collaboration of 40 researchers from the U.S., Europe, and the Middle East, including Dr. Liora Kolska Horwitz and Ron Kahati from The Hebrew University, Prof. Guy Bar-Oz from the University of Haifa, as well as scientists from Iran. The researchers extracted DNA from 83 domesticated goat remains found at Stone-Age archeological sites in three main regions: the western region (Anatolia and the Balkan), the eastern region (Iran and Turkmenistan), and the southern region (Israel and Jordan). They identified profound genetic differences between goats from the three groups, and compared the samples to the DNA of pre-domestication wild goats found in the same region. The findings indicate that the wild goats diverged into two genetically distinct groups – eastern and western – as early as 47 thousand years ago, namely tens of thousands of years before humans began domesticating them. The domesticated goats in Iran and its neighboring countries during the Stone Age evolved from the eastern wild goats, while the domesticated goats of the southern and western regions had DNA originating from both groups of wild goats. The researchers concluded that goats were domesticated on different occasions at different locations from the resident wild goat populations. This joins previous studies that claim that various species were domesticated more than once and in more than one location, and even that the farmers themselves came from different populations: the people who lived in Turkey during the Stone Age had a different genetic background than those living in Iran. It seems the main motivation for the expansion of domestication in the Fertile Crescent was not the migration of a group of farmers (and their livestock) from one region to the other, but rather, the trade and transfer of technologies and innovations between different groups; for instance, the idea to farm goats. Today, most European goats are the descendants of the first domesticated goats from the western region, Anatolia and Balkan, while the goats in Eastern Asia originate from the goats of the eastern region. 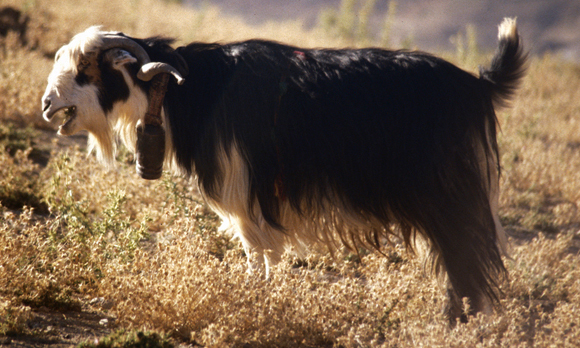 The African goats come mainly from Israel and Jordan, but they also contain quite a bit of DNA from other sources. The first domesticated goats were different from wild goats – the early goatherds chose those that best suited their needs and bred them, thus creating a new strain. What properties did these chosen goats bear that were beneficial in the eyes of the early goatherds? To examine this, the scientists searched for genes that were selected in the domesticated goats and were different from those of the wild goats. Some were somewhat predictable: one gene, for instance, is involved in milk production, and another determines the length of time needed between pregnancies. The goatherds, of course, preferred goats that produce more milk and give birth to more kids in a shorter amount of time. Other genes were less obvious, such as the gene that determines the color of their wool. Domesticated goats tend to have a colorful coat, at times with a spotted pattern, in contrast to the wild goat, which typically sport a uniform coat. Some researchers suggested that spots, which appear somewhat differently on each goat, enable distinguishing them from one another – an important property when goats belonging to a number of goatherds are herded together. It is also possible, of course, that the early goatherds just found the spots more beautiful or had the postmortem use of the goat's hair in mind. Another study about animal domestication was published in the same issue of Science. This study examines the origin of dogs in the Americas prior to European settlement. Its findings, in a certain sense, contrast those of the goat study: The first Americans did not domesticate dogs from the wolves in their environment, but rather, brought them along when they migrated to the continent. Genetic evidence shows that the early American dogs were especially closely related to dogs from Siberia, the origin of those early settlers. It appears that when humans migrated to the new continent they brought along the domesticated animals they were already familiar with. However, in the Fertile Crescent, a cultural transfer between neighboring populations occurred without migration, and there, the mere idea of domestication – not the animals themselves – is what passed from one region to another. Перезвоните мне пожалуйста 8 (812)309-40-10 Юлия.